Streamlined looks on a sturdy frame. Slim tapered arms and a tightly padded back make Everly feel roomy even in smaller areas. Pair this simple design with high performance fabric for a durable piece in high traffic environments. That’s why we build all our upholstered furniture in-house to your specifications as soon as you order it. Our hands-on approach ensures that we hold ourselves accountable for every detail. The internal assembly uses premium glue, stainless steel staples, and threaded fasteners. Constructed using ¾ inch furniture-grade plywood. Seat suspension features sinuous springs of 8-gauge hardened tubular steel with 16-gauge cross brace wires. Features high-resiliency foam and premium synthetic fibers. CAL 117 foam with upgrades to TB 133 standards available. Also available with nailhead trim, (HA535-10NH). Exposed wood components are made of quality hardwood. Wood finish shown is Old Vine, available in all standard and premium wood finish options. Our standard and premium wood finishes are solvent free and water based. Shown in Customer’s Own Material (COM) fabric, piece is also available in in-line, COM fabrics, and grade-in fabrics. Part of the Everly group. Choose from a wide range of styles, or supply your own cover materials, for a look that’s right for you. Click the link below to view our in-line fabric options and download images and technical specifications. Also, fabrics are available in virtually any color and pattern. We offer standard, premium, and custom finishes for all exposed wood. Click here to see our in-line program with downloadable images. 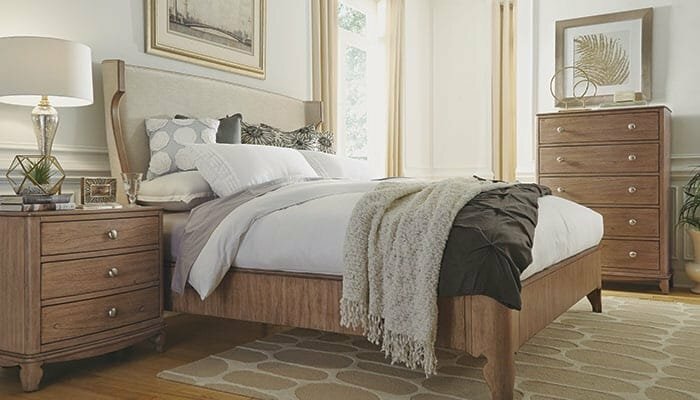 Why can’t I purchase furniture online? Flexsteel Contract furniture is not available for purchase through this website. Please contact a Flexsteel sales representative or our Customer Care Team for purchasing options. Visit Find Flexsteel to get in touch with a sales representative. Can I order extra or replacement parts? Yes, please get in touch with a Flexsteel sales representative or our Customer Care Team. Visit Find Flexsteel to contact a sales representative. Do you offer custom designs of your furniture? We'd love to work with you to create the furniture that's right for your project. Visit Find Flexsteel to get in touch with a sales representative. All warranty time periods begin from date of delivery. Flexsteel warrants its exposed-wood products, including dining and end tables, to be free from defects in materials and workmanship for one year from the date of delivery (excluding modAllure). During this period, at its option, Flexsteel will repair or replace, free of charge, products that prove to be defective. Applies to sleepers with the standard 2700 bed mechanism under conditions of normal use. Applies to the Standard Comfort innerspring sleeper mattress under conditions of normal use. All Flexsteel fully upholstered styles carry a five-year warranty on the drop-in sinuous wire (zigger) unit, wood frame and seat cushion. These warranties are based on conditions of normal use. During this period, at its option, Flexsteel will repair or replace, free of charge, products that prove to be defective. Applies to furniture manufactured with Web seat foundation. Flexsteel warrants the Web seat foundation and hardwood seat frame against breakage under conditions of normal use. Applies to sleepers with the optional 3500, 7000, Jule, and Side Sleep bed mechanisms under conditions of normal use. Applies to the Hospitality Comfort innerspring, Superior Comfort innerspring, Jule, and Side Sleep mattresses, against defects in workmanship or material, other than covering, under conditions of normal use. As it relates to normal use, Jule and Side sleeper mechanism are not designed to be closed inside furniture with bedding articles, including but not limited to sheets, blankets, pillows, or any other objects. Failure to adhere to this warning can cause damage to the mechanism, and such damage is not covered under this five-year (5) warranty. All Flexsteel recliners carry a five-year warranty on the Flexsteel seat spring unit, wood frame and recliner mechanism. All other parts; base unit, lumbar support, articulated headrest and the power motor on the electric lift recliner carry a one-year warranty. These warranties are based on conditions of normal use. Applies to the polyurethane foam. All modAllure wood frame products, foam and seat springs to be free from defects in materials and workmanship for five years from the date of delivery. During this period, at its option, Flexsteel will repair or replace, free of charge, products that prove to be defective. Applies to only the Flexsteel blue steel seat spring and frame. Flexsteel warrants these products against breakage under conditions of normal use. Warranties not expressly stated herein, including without limitations any implied warranties of merchantability and fitness for purpose, are excluded and disclaimed by Flexsteel Industries, Inc.
Flexsteel will make every effort to make on-time deliveries; however, we are not responsible for the loss of revenue due to late delivery. Flexsteel shall not, in any event, be liable for the cost of any special direct, indirect, incidental or consequential damages to anyone due to the breach of any warranty hereunder. Flexsteel’s sole obligation shall be to repair or replace any product which proves defective during the warranty period. Whenever a special wood finish is requested, Flexsteel will attempt to match for color but does not assume responsibility for color variation resulting from this finish being applied to various hardwoods. The warranties do not apply to damage resulting from accident, alteration, misuse, negligence, abuse or abnormal wear. Flexsteel warrants its Acute Healthcare products to be free from defects in materials and workmanship for five years from the date of delivery. These warranties are based on conditions of normal use. If problems occur during the stated timeline, Flexsteel will review incidences and determine whether or not a repair or replacement is qualified. Repairs and replacements will be free of charge on all qualified products. Please note all fabrics are covered to the extent of fabric manufacturer’s warranty. Flexsteel warrants its Flexsteel Blue Spring Support System and Metal Frame to be free from defects in materials and workmanship for Lifetime from the date of delivery. These warranties are based on conditions of normal use. If problems occur during the stated timeline, Flexsteel will review incidences and determine whether or not a repair or replacement is qualified. Repairs and replacements will be free of charge on all qualified products. Warranties not expressly stated herein, including without limitations any implied warranties or merchantability and fitness for purpose, are excluded and disclaimed by Flexsteel Industries, Inc.
Flexsteel shall not in any event be liable for the cost of any special direct, indirect, incidental or consequential damages to anyone due to the breach on any warranty aforementioned. Flexsteel’s sole obligation shall be to repair or replace any product which proves defective during the warranty period. Flexsteel will make every effort to make on-time deliveries; however, we are not responsible for loss of revenue due to late delivery. Flexsteel shall not in any event be liable for the cost of any special direct, indirect, incidental or consequential damages to anyone due to the breach on any warranty hereunder. Flexsteel’s sole obligation shall be to repair or replace any product, which proves defective during the warranty period. Whenever a special wood finish is requested, Flexsteel will attempt to match for color, but does not assume responsibility for color variation resulting from this finish being applied to various hardwoods. The above warranties do not apply to damage resulting from accident, alteration, misuse, negligence, abuse or abnormal wear. Flexsteel warrants its Senior Living products to be free from defects in materials and workmanship for five years from the date of delivery. These warranties are based on conditions of normal use. If problems occur during the stated timeline, Flexsteel will review incidences and determine whether or not a repair or replacement is qualified. Repairs and replacements will be free of charge on all qualified products. Please note all fabrics are covered to the extent of fabric manufacturer’s warranty. Applies to furniture manufactured with Dymetrol seat foundation. Flexsteel warrants the Dymetrol seat foundation and hardwood seat frame against breakage under conditions of normal use. All Flexsteel recliners carry a five-year warranty on the Flexsteel seat spring unit, wood frame and recliner mechanism. All other parts, base unit, lumbar support, articulated headrest and the power motor on the electric lift recliner carry a one-year warranty. These warranties are based on conditions of normal use. Applies to the 2.5 (HR) high-resiliency, high-density urethane foam seat cushion and to the Luxury Cushion (LC) foam seat cushion when used on fully upholstered product. Applies to sleepers with the optional 3500 be mechanism under conditions of normal use. Applies to the Dreamflex innerspring sleeper mattress under conditions of normal use. your furniture. Your notification must be given to an authorized DMI dealer with proof of purchase. After notification, it may be necessary for the Authorized Dealer or the manufacturer to arrange for an inspection of your furniture to determine whether or not a covered defect exists. If a covered defect does exist, it will be repaired. If it is determined that repair is not practical; you will be supplied with new furniture of the same or similar color, design, style and quality at the current price less depreciated value of the product as based on ASB standards for straight line depreciation of Office Furniture. You will not be charged for any repair services, delivery costs. No implied warranties, including warranties of merchantability or fitness for a particular purpose exist. By implied warranties, we mean ones that the law requires to have been given by the seller even though they are not set out in writing. Please note: some states do not allow exclusion or limitation on how long an implied warranty lasts, so the above limitation or exclusion may not apply to you. This limited warranty protects you only when you purchase furniture from an Authorized Dealer and if you are the original owner of the product. This limited warranty applies only when you have purchased the furniture for your own use and not for resale prior to use. Your furniture requires some routine maintenance. Keep it clean, dusted and polished as necessary. Proper care and use are essential to preserving the rights under this limited warranty. We will not repair or replace your furniture if damage is caused by improper maintenance or by improper use. This limited warranty does not cover damage resulting from abuse, normal wear and tear, and accidents including burns, cuts, scratches, scuffs, watermarks or indentations. Consequential or incidental damages are not covered under this limited warranty. By this we mean any loss, expense or damage other than to the furniture itself that may result from a defect in the furniture. Please note: some states do not allow the exclusion or limitation of incidental or consequential damages, so the above limitation or exclusion may not apply to you. Browse coordinating collections and groups in a variety of furniture settings.